I’ve figured all along that folks who read this blog are well-aware of all the goings-on surrounding the International League All-Star Game this week. If not, here are some links to bring things up-to-date. Then there’s the game on Wednesday. How to listen/watch here. Bulls announcers will be sharing the broadcast booth with a Pacific Coast League broadcaster for a national radio show. Television will be through the MLB Network. Here’s hoping that the TV guys do a better job than last year when they seemed to ignore events on the field, especially near the end of the game. This is not as simple as National League against the American League. All the Triple-A teams are, obviously, linked to a major league team, but the Pacific Coast League and the International League are essentially built on major league teams east and west of the Mississippi River. There are a couple of notable exceptions to that way of thinking about the leagues, but that’s mostly true. Also, in general, the PCL is considered something of a hitters league because of several high-altitude parks. Lastly, and there are probably a couple of exceptions to this, the PCL towns have not shown the enthusiasm for new/renovated stadiums that the IL has. 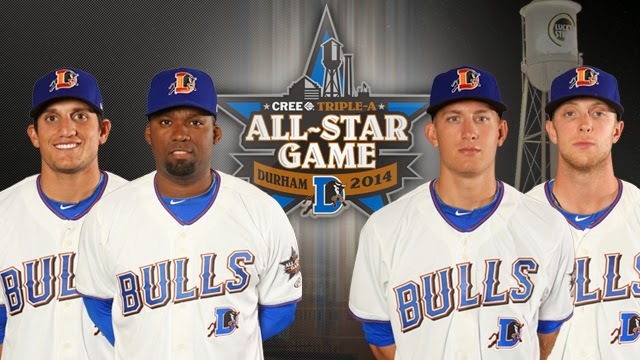 The Bulls have four players on the list for the IL team, two hitters — Mikie Mahtook and Wilson Betemit — and two pitchers — Merrill Kelly and Mike Montgomery. A really big deal is the manager of the IL team, the Bulls’ own Charlie Montoyo. He got a nice profile in the N&O the other day. The rest of the IL team is here and the PCL team is here. Note: judging from the headlines, the Durham Herald-Sun has some good coverage. Worth a look if you have a subscription.